Get Him to the Greek becomes insane. 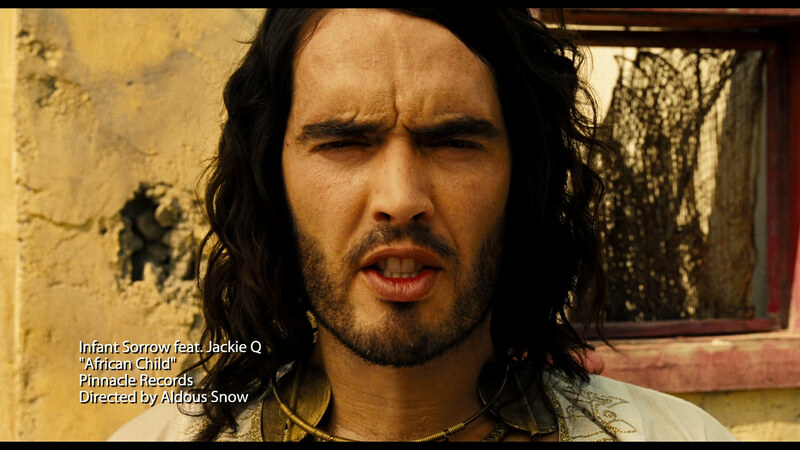 Aaron Greene (Jonah Hill) must get rocker Aldous Snow (Russell Brand) from London to Los Angeles for a 10-year anniversary concert. They become sidetracked in Las Vegas, where Snow’s father Johnathan (Colm Meaney) resides. Greene’s boss Sergio (Sean Combs) meets up with the traveling crew, who begin tripping on a drug cocktail known as a Jefferey. Within minutes, someone is thrown through a television, Greene thinks he’s having a heart attack, the room is set on fire, and Greene goes berserk after being injected with adrenaline. The issue with all of this is that it doesn’t feel crazed. The direction is mundane, the editing sluggish, and the musical backdrop of “Come on Eileen” doesn’t help. Maybe the latter is funny, but the scene needs a push towards the zany, and it simply doesn’t have it. Other gags work as intended, such as Snow trying to smuggle heroin through airport security in a “private” manner, or the music, which for the record is nothing short of brilliant. From the opening track called “African Child” to “Bangers, Beans, and Mash” each has their own lyrical genius, reaching new levels of unbelievable stupidity in an effort to completely slam what the music industry has become. Yes, all of this idiocy has a point. Greek never quite reaches the lofty comedic heights set by its source material, this a spin-off of Forgetting Sarah Marshall. It has brief flashes, most of those moments so absurdly perverse even describing them would earn this site an R-rating. Brand is fine as this drug-addicted rocker, thoroughly believable in fact, and Hill is that loveable goofball sidekick, but Greek doesn’t have enough punch to click like its material probably did on paper. The close-ups are surely the highlight of this AVC encode, Universal apparently switching codecs after a string of releases utilized VC-1. Regardless, Get Him to the Greek swaps between film and digital in the early going, The first shot of Snow’s music video is certainly film, a light, resolved grain structure visible. Then, it turns into an interview segment and it looks on par with a cable hi-def broadcast, albeit with better compression. The swapping continues until it settles into film, with the sole exception of a Today’s Show appearance. The problem is it doesn’t always look like film. Meredith Vieira stills looks quite digital even off the set, as does Snow later at 46:33 during a phone conversation. Some aliasing dominates the early shots of the various tabloids at 5:26 as well. The problems are minor though, inconsistent in terms of texture being the only other issue of note. This is a resoundingly pleasing transfer in general, the level of facial detail on display at times staggering. Sean Combs has an incredibly rich, textured face that comes through on this disc every time he is on camera. The first instance is at 12:03, and the detail is consistent until his final appearance at 1:34:37. The same goes for nearly every actor/actress in the film. Jonah Hill is a bit off the mark in spots, but even he has some resolved, crisp close-ups, 13:53 being an example. The film is rife with texture, from clothes, to buildings, to carpets. Establishing views, London especially at 20:59, nothing short of spectacular. The sights are many, aided by wonderful, deep black levels. Shadow detail is fine, and dimensionality is superb. Colors are elevated, brightly saturated while keeping the flesh tones natural. The color scheme exists to accentuate the nature of the film, and it works wonders. Sharpness remains firm, that excluding the digital sequences, and a green screened scene at 1:14:06 looks rather poor in comparison as well. The problems are few in terms of the overall running time, as this is a fine encode and wonderfully rich source. One would suspect a film centered squarely on music would produce some spectacular audio, and that’s simply not the case. The opening musical number is fine, at least in terms of clarity and vibrancy. The surrounds are flat however, and that proves to the downer. There are two concert sequences of note, one on the Today’s Show (38:00), the other at the finale. Both are mundane, lacking highlights, surround aggressiveness, and atmosphere. The music seems planted in the stereo channels, delivering almost no echo effect to speak of and thus killing the “live” feeling. The crowd seems to be the focal point of the rears, with various cheers and screams strewn about this DTS-HD mix, yet compared to some other concert films, this is anemic. Not that much is expected from a comedy, but this is a musical affair. Audio should be the key. Dialogue scenes in clubs are flat, again loading the fronts while ignoring the surrounds. The low-end is fine, reproducing a clean, smooth bass line, and providing a jolt or two where needed. Dialogue can be a bit overwhelmed too, situated low in the mix, making whispered lines of necessary chatting almost unintelligible. This is not a terrible effort; it obviously benefits from being modern audio design, everything flawless in terms of fidelity. The expectation is higher here though. A commentary leads the extras with director Nicholas Stoller, actors Jonah Hill, Russell Brand, Ross Byrne, Elisabeth Moss, and producer Rodney Rothman. Getting Him to the Greek is the making-of, a decent half-hour piece on the production. Getting in Tune with the Greek is all about the songs and their creation. Making of African Child is an in-character featurette with Brand touring the set of the infamous music video. Seven sections detail the music of the film, with full music videos, concert clips, and more. There was a lot of attention paid to the humor here. You can sing along with these songs too, a karaoke section housing nine of the tracks. U-Control offers direct access to the music. The unrated version of the film is included as well (all time stamps refer to the theatrical cut), running about four-minutes longer. BD-Live support doesn’t contain any features detailing Greek, but does offer you the option to stream one of three films as a one-time rental. For review purposes, Uncle Buck was chosen. After an arduous registration process, you are given the film for a 24-hour period for playback on your TV, PC via Universal’s site, and portable device. Quality was only fair, the bitrate managing to stay between 3 and 5mbps, probably a bit weaker than a DVD edition. Audio was DTS streaming in stereo. In all, it’s easier to pick up the DVD edition for a few bucks. It’s simply not worth the hassle to stream, plus the restrictions are ridiculous.